Charlie Grey of Belfast speaks Tuesday night during an emotional RSU 20 board of directors meeting about next year's school budget, which will include drastic cuts to programs and positions. "I elected you to take care of the children of this community, to look out for their welfare," he said to the directors. "They are the future. They are the future of this community...I can't understand how you can go home and sleep in good conscience." 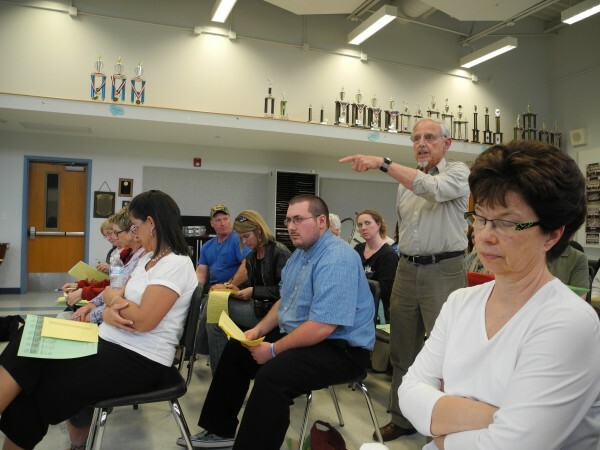 BELFAST, Maine — Shock, anger and sadness were in the air Tuesday night in the Belfast Area High School band room as the RSU 20 board of directors voted on a school budget that will make drastic position cuts and still cause local property taxes for education to go up significantly. “We’re doing the best we can, but the problem is simply too substantial,” Gerald Reid, a director from Northport, said at the outset of the long, emotional special meeting. The eight-town school district is facing a budget shortfall of $3.8 million, part of which is caused by the town of Frankfort’s decision to withdraw from RSU 20 and join SAD 22 to the north, taking its state subsidies with it. Other problems for the district are increased costs for insurance and teacher and support staff salaries as well as Gov. Paul LePage’s proposed strategy to shift costs for teacher retirement from the state to the local level. Directors voted Tuesday night to recommend to the district’s voters a 2013-2014 budget of $33.486 million — which marks just a $100,000 or so increase over this year’s school budget. But because of sharp revenue decreases, they also voted to recommend cuts totaling $1.7 million, including the elimination of stipends for all middle school extracurricular activities, one-and-a-half art teaching positions, all elementary school librarian ed techs, two custodians, one-and-a-half middle school language teaching positions and a science teacher at Belfast Area High School. Even with those cuts, the local property tax assessment for schools will increase nearly 13 percent over last year — which many in the audience said will be hard to swallow. Property taxpayers in Belfast, Belmont, Morrill, Northport, Searsmont, Searsport, Stockton Springs and Swanville will be expected to pay about $22 million for schools in the next fiscal year, up from about $19 million in locally generated revenue this year. The decision to vote on this budget was clearly hard for the directors. The board voted to recommend the budget to residents, who will have the ultimate authority to approve it. The 2013-2014 RSU 20 budget will be presented to the district’s voters at an open meeting scheduled for 7 p.m. Thursday, May 30, at Troy Howard Middle School in Belfast. They will have the chance to vote on it during the next week.